Let’s play connect the dots. The dots form this picture: epic public borrowing substitutes for normal economic activity, with no end in sight. We are witnessing a titanic battle between deflationary economic conditions and inflationary federal policy. Anything could happen. Hope it doesn’t. CalculatedRisk already said this in December 2009, but he buried the lead, so a lot of people likely missed it: for the foreseeable future, house prices are far more likely to fall than rise, because mortgage rates are rising, personal income is flat, and subsidies are falling. Homes, unlike other kinds of real estate, are historically priced not by their earning power, but as a more-or-less fixed percentage of personal income. That is, homeowners take on the mortgage they can afford, which is a relatively stable percentage of income. During the bubble, that relationship got out of whack, but has since been mostly restored (it’s still higher than the historical average, but not much). This has led the Wall Street Journal and others to argue that houses are now cheap. But that makes an extrapolation error. Today’s affordability depends upon today’s interest rates, income and homeowner subsidies. If these change, then prices will eventually change with them. Subsidies (mortgage deduction, homebuyer credit) will be expanded. None of these is realistic; in fact, all three are moving in the opposite direction. Homes are becoming less affordable. Right now. The odds of an abrupt reversal are remote. Thus, in aggregate, house prices will probably stagnate or decline for the foreseeable future. There will be regional exceptions, but this is the overall picture for housing in the United States. The Greek financial crisis is a mere deck chair on a political Titanic: European monetary union is inherently unstable without fiscal and central bank union. Fiscal/central bank union would require political union, a political impossibility. Thus, EMU cannot move past its current unstable state. Retreating to a mere trade union offers most of the benefits of EMU, at a fraction of the complexity and distortion. Thus, almost inevitably, the euro area will shrink or break up, while the EU trade area will thrive. Why is EMU inherently unstable? Because it is, by its nature, a transitional condition. Fiat currency, central bank and fiscal policy are logically a single module: a governing entity manages its fiat currency through fiscal and monetary policy to achieve domestic political goals (rational or irrational, short or long term oriented). If a country tries to use someone else’s fiat currency without control of the monetary and fiscal policy of that currency (as occurs, for example, when Argentina dollarizes or when China pegs, or when Greece euro-izes), the result, every time, is systemic imbalance: inflation/deflation, current account deficit/surplus, etc. This happens because the solution to such imbalances is to revalue the currency — but they can’t, because it’s someone else’s currency. To eliminate these distortions, the inevitable end is always either to unify more (merge politically) or less (stop using someone else’s currency). Some EU framers understood this, and from the beginning intended EMU to be a transitional step toward political union. However, as it turned out, EMU was opposed by a popular majority in nearly every country where it was adopted. Going further — giving up the national budget to Brussels — is obviously impossible in the foreseeable future. So one has to ask if an inherently transitional state, with its inherent distortions, can persist indefinitely. Present a united geopolitical force vs the USSR. Prevent nationalist warfare among European states. But in the 60 years it has taken to get this far, conditions have completely changed. There is little external military threat. Intra-European warfare sounds quaint. Europe’s trade union, coupled with modern IT/comms technology, has already greatly reduced cross-border transaction costs. Under modern geopolitical conditions, a mere trade union may be Pareto-optimal: with a fraction of the complexity and distortion of a currency union, a trade union achieves most of the economic benefit, provides most of the necessary bargaining power vs Russia, yet avoids, for example, the inherent division between fiscal management styles of Mediterranean and non-Mediterranean countries. A partial euro breakup may thus be inevitable, but, given the impossibility of political union, may also be for the best. In essence, Europe is doing something today that makes no sense — just because it made sense 50 years ago. Just before the Iraq invasion in 2003, I commented to a friend that we should instead just buy Siberia. At the time, oil prices were relatively low, so Russia was in difficult straits. They were short on cash, and faced a growing geopolitical threat from China, whose population outnumbers Russia by 9 to 1 across a very long, very thinly defended border. Meanwhile, the US was still flush with credit (if not cash), able to buy what it wanted. At that time, the entire GDP of Russia was only about $800 billion. My proposal was that we offer them that much in cash — an entire year’s income for their entire country — in return for the coldest, least desirable, least habitable, least populated, least defensible part of eastern Russia. And all its oil and gas rights, of course. We would agree to defend it with only conventional forces, no missiles, no nukes, etc. This would solve our oil problem. Russia could hand its China problem to America. And we could stay thousands of miles away from the Middle East. No, Russia would never have agreed to it. The point of proposing this idea, then as now, was to put the cost of the Iraq war in perspective. The estimated total cost of our Iraq adventure (excluding human cost) is now around $5 trillion, or 6 times the entire GDP of Russian in 2003. Good investment? The Wall Street Journal reported today that the IRS is seeing massive fraud in the homebuyer tax credit. The article mentions something I hadn’t noticed: the tax credit is refundable, which means that if you don’t owe any tax, then the government actually pays you. This one fact brings the whole picture into focus, and reveals what a bad idea the credit and other incentives are, even without borrower fraud. Let’s say you are a renter with a short planning horizon, no understanding of finance, and no moral compass, other than a desire to avoid jail time. Carpe diem, dude! One day, the government offers you a rich tax credit for buying a house. The FHA is falling over itself to offer you a subsidized loan. A friendly homebuilder points out that, if you buy enough house, your interest deduction will exceed your income tax obligation. This lets you stop all your salary withholding right now(! ), and you’ll still actually collect $8,000 in April. Maybe the builder even happens to know someone — unaffiliated, naturally — who will lend you the down payment. Carpe Diem Dude’s perspective: you pay nothing down, and immediately get a new house, a 25% raise in take-home pay (which mostly goes to the mortgage payment), plus an $8,000 check next April. If you wipe out and default, well hey, that’s a long time from now — months, maybe — and it was never your money anyway. Besides, you keep the $8,000. Why not? Friendly Homebuilder’s perspective: you get a desperately needed home sale, which saves your job. It costs you and your company nothing, assuming that you jacked up the purchase price by enough to pay your cousin Icepick to loan the down payment to Carpe Diem Dude (oops, did I say that, or just think that?). If the buyer defaults, hey, it’s the FHA’s money, no harm no foul. FHA’s perspective: you are a government-backed agency receiving constant pressure to write new loans. Your Congressional taskmasters say publicly that writing bad loans is the policy, so keep up the good work. And hey, if it all comes apart, you were just following orders. Has college become a bad investment? Private college appears to deliver negative lifetime return on investment to most attendees. Provisos are itemized below, so please resist your instinct to recoil, and read the whole thing. The Census Bureau reported in 2002 that the median college grad’s income was $45,400, compared to $25,900 for the median high school grad. The College Board reported in 2006 that private college consumed an average of 5.3 years of the student’s time. Public college took 6.4 years. I made these rough assumptions: 40-year working life; discount rate of 8%; fully loaded tax rate of 30%, including all mandatory payments to all levels of government. Based on those sources and assumptions, the after-tax present value benefit of a private college degree is about $65,000. That’s total, not per year. Unfortunately, college costs much more than that — the College Board says the average is $53,000 $69,000 in tuition and fees alone, including all financial aid, before food and rent. Add in living expenses, and you’re far beyond $65,000. So it appears the return on investment is very likely negative for most families, and even more negative if we consider the cost of the subsidies. This is not an argument for more aid, nor less aid. ROI (return on investment) appears negative regardless of whether tuition is paid by the parent, student loans, scholarships, or the government. The problem is not financing or subsidy levels, but the fundamental cost/benefit equation. This is not bashing private colleges. I have degrees from three, and I’m glad. NPV is a dubious instrument, highly sensitive to tiny estimation errors in the discount rate. You can prove anything by turning that dial. But note that the discount rate would have to be below 6% to justify anything like the median cost of private college today. It doesn’t add up. College offers the option value of attending graduate school, which is not reflected in this calculation. College may have indirect benefits not captured by NPV. College may have positive externalities for society as a whole, not measured here. The latest census data on income is several years old, which could invalidate the result. But I believe it still holds true, because incomes are purportedly nearly stagnant. There are plenty of ways you could pick this apart, but it’s rearranging deck chairs on an investment Titanic: the answer is so far below zero that you have to make flattering assumptions for private college to look sensible. Pretty sobering, because it was almost certainly not the case a generation ago. Public college ROI might be better or worse: tuition is lower, but since it is internally subsidized, we do not know if the actual cost is lower (though I suspect it is). We do know that students spend much longer attaining a degree there, causing more foregone income. Could go either way. This follows up on last week’s assertion that many private colleges are a bad investment, viewed from a purely financial perspective. Obviously college has more than mere financial benefits. But those additional benefits are of interest mainly to families that are already somewhat prosperous and educated. If you agree that much of the value in affordable college education is to help people up the economic ladder, then you must also agree that such people are mainly interested in return on investment — it’s tautological. In the previous post, I suggested that the cost of servicing college debts was often greater than the financial benefit of college. This post is more general: it argues that the net present value (NPV) of an investment in college, no matter how it is paid for, will often be less than zero. This is the mathematical definition of a bad investment. Caveat: be suspicious of NPV arguments, as I’m about to present here. The NPV equation is inherently unstable. Its terminal value contains the term (1+g)/(r-g), where g is the growth rate and r is the discount rate, is obviously extremely sensitive to the choice of discount rate. It’s a tiny number in the denominator — little changes make a big difference. Tweak that knob a little bit, and you can prove almost anything. This little arithmetic detail is the precise reason that huge companies make foolish mergers — but that’s another story. Studies supposedly show that college increases median income by about $19,000. But that’s pretax. The after-tax benefit is more like $12,500. This should really be reduced further to reflect alums who end up not working, but let’s ignore that for now. We’ll choose a discount rate of 8% — actually quite low, only 3% over a reasonable long-run risk-free rate, on the presumption that one’s income is increased with high reliability by going to college. This yields a present value for a 40-year working life of about $150,000. Thus the maximum tuition you should be willing to pay for a “median” college education should be $150,000, or $37,500 per year, assuming no tuition increases. Uh oh. The College Board says the average student in 2005 took 5.3 years to complete private college at $30,367 per year, or a total of $152k. Conclusion: private college is a bad investment in many, probably even most, cases. We’re being very generous here — the true situation is almost certainly worse. For example, the unemployment rate among new alums is now ~20%, so we should reduce the first-year median income by that amount. This cuts PV to $140,000. As another example, interest rates are highly likely to be unusually high over the next 20 years. If the discount rate is 12%, then the maximum logical college expense (tuition plus all expenses) is only $104,000. Again, the point is that this suggests a low or negative return on investment for expensive second-tier private colleges, regardless of who pays, or how. Whether the government pays, or the school, or your parents, or you borrow tuition from Sallie Mae, the answer is the same: low or negative return on investment. A few silver linings: personal choices can greatly affect outcome. The levers are the choice of school, choice of major, and number of years spent there. If you go to a private school known for good placement, then major in something marketable, and then place out of your freshman year with your good AP test scores, then you’re going to do fine. For everyone else, it looks like the whole system needs a radical overhaul. If this doesn’t alarm you, then nothing will. Why? 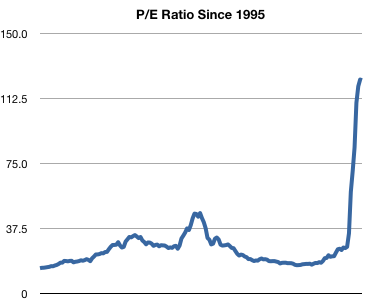 Because P/E ratio is a simple and more or less proven predictor of long-term stock market returns. Lower is better. 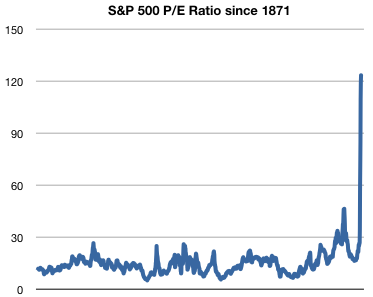 When P/E is 10 times greater than the 138-year average, and 3 times its previous all-time peak, when interest rates are already zero, we are in totally uncharted waters. The one bright note for stock market investors is that the S&P500 is a weighted index. The financial sector contributed a big chunk of the overall index profits, and most of that went away. So one interpretation of these graphs is that certain ultra-large-cap stocks are fantastically overpriced, even as many smaller value stocks are still fairly priced. At minimum, this appears to argue strongly against holding a traditional S&P index fund. One may do significantly better by owning a low-PE index fund like Vanguard Small-Cap Value Index (VISVX). I heard this week that Georgetown University now costs $65k per year, all in. I verified it afterward: tuition is $35k, the rest living expenses. Costs are similar at many private schools. You see gee-whiz stories like this all the time, but I’m not going to do that. Let’s try a little arithmetic instead. Let’s say you borrowed the entire cost of a 4-year private college education, as many people do. Student loans are 30-year amortized, just like home loans, so at 5% interest, your payment is about $1400 a month for 30 years. But that’s an after-tax expense. Student loans get almost no tax deduction; let’s say you qualify for the maximum deduction, $2500 per year. Result: your PRETAX cost to service that debt is a bit over $24,000 per year. Here’s where it gets interesting. The median college graduate’s income is about $45,000 per year, while the median high school grad’s income is $26,000. In short, college increases your pretax income by a median $19,000. You then pay out $24,000 on those student loans, and… well, I hope you learned enough arithmetic at that fancy college to realize YOU ARE HOSED to the tune of a $5,000 net loss per year, for the next 30 years. Even the above dramatically understates the problem, because it ignores that the high school grad pays a much lower marginal tax rate; that tuition is still rising faster than incomes; and, most importantly, that the interest rate on your student loans in the future is highly, highly likely to be much higher than 5%. In short, it doesn’t work. It can’t work. Unless you have a full scholarship or wealthy parents, you have only a few logical choices. Go to an inexpensive public university. Go to a top-tier private school that is highly likely to increase your income by much more than the median. It’s Ivy League or bust — literally. Choose only a major that pays far more than the median. Art history majors, be afraid. Borrow the full amount, then default and skip the country. Tough decisions coming, folks. And to think that, just a couple of years ago, your hardest choice was, “Escalade or Navigator?” HELOC-funded, of course. [Schumpeter says] mass unemployment is necessary, because you have to shift resources away from sectors that got too big, stimulus is a bad thing because it slows the necessary adjustment. And now as then, the whole notion falls apart when you ask why, say, a housing boom — which requires shifting resources into housing — doesn’t produce the same kind of unemployment as a housing bust that shifts resources out of housing. Investment bubbles collapse much faster than they inflate. In the real world, labor can only redeploy so fast. If capital reallocation exceeds that rate, you get unemployment. So on the way up, capital redeploys slowly enough for labor to react smoothly. No unemployment. On the way down, capital redeploys much faster than labor can. Presto, unemployment. (more speculatively) In the short run, bubbles increase the blended rate of return on capital for the whole economy. Higher ROI permits overall employment to rise above the rate that would have prevailed without a bubble. When it bursts, ROI falls, so unemployment rises.